I returned home from a short night fishing session last night following what has become a rare event in 2019 – a big fat blank! I won’t lie, I’ve been delaying writing this post for a week as I was hoping to catch a significant fish – something that I managed during each of the winter months of December here, January here and here, and the most satisfying of all, during February here and here. 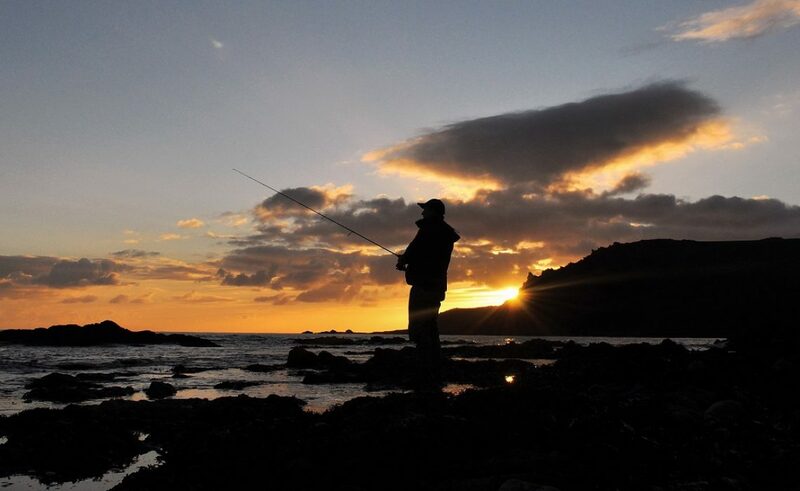 High pressure and calm, clear seas = good night fishing conditions! The first half of the March was rather unsettled to say the least. But as each Atlantic weather system piled in, the more I began to realise that a certain stretch of coastline that I have adopted as ‘having potential in rough seas’ would indeed remain safe and relatively calm, but most importantly, the water did remain clear compared to the ‘muddy mess’ surrounding most of my other 160 or so marks. On a couple of evenings during the second week of March, and with a Gale blowing over my head I managed to eek out a couple of small bass in darkness – all of which bodes well for later in the season if I am with a group of clients and literally everywhere else is unfishable due to high seas and murky water. An early ‘March bass’ that was caught from a very secluded and sheltered venue when large portions of the coastline were severely churned up. Good news for my prospective clients. Calm nights and countless bites! As we entered the second half of March I was extremely pleased and excited to see the forecast area of high pressure manoeuvring itself to sit right on to of us – serving to create some ‘perfect’ night time conditions. On the first attempt I landed three bass, with two on the second night to real variety of lures, including a white 5″ senko here, the Whiplash Factory Spittin Wire (a surface lure) here and a new lure (a needlefish) that I will reveal at a later date. 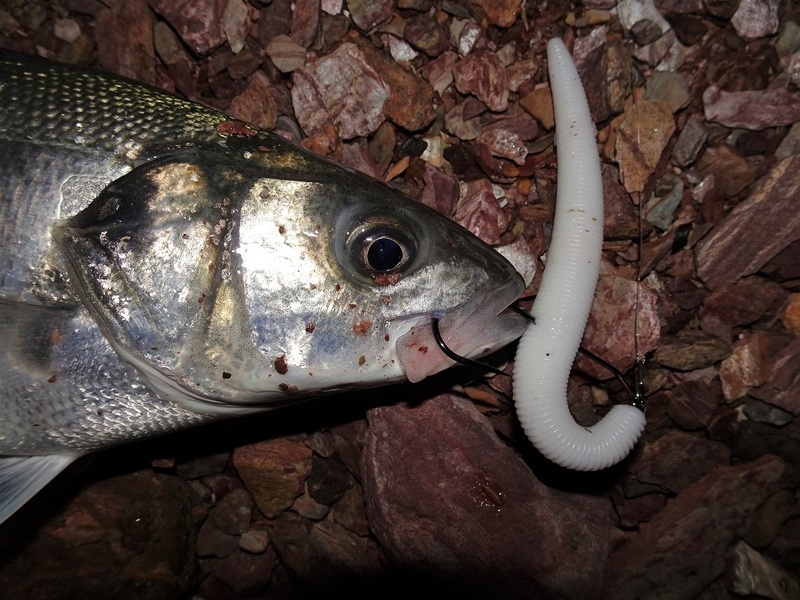 Catching bass at night on surface lures is something I am keen to explore this coming season. All of the bass landed were in the 1-2lb range (schoolies), and judging by the amount of bites that I received over the course of those sessions, I would definitely say that there were ‘shoals’ of bass present – as I simply lost count of the number of taps, whacks, plucks and splashes aimed at whatever was seemingly attached to my lure clip! I don’t think I would have noticed this at sea level, but it appeared to me that the water/sea was essentially swirling, in a subtle manner, like a giant whirlpool into the area. When I thought about it, it made sense of the fact that there have been numerous occasions when I have felt pressure on the braid and rod tip (like a weed fragment on the hook) when retrieving the lure (at night) with the direction in which the current should have been flowing. I think that due to that swirling affect though, at certain stages of the session I would been inadvertently dragging the lure through, and therefore against, the natural movement of the current. Not large, but in mid-March I am just happy to be connecting with bass. It is certainly more conducive to catching them than this time last year when it extremely cold and bleak! With the above at the forefront of my mind, during the next few sessions, if I felt pressure on the line during the cast and retrieve in a certain direction I would endeavour to cast and retrieve the lure in almost the opposite direction – so to ensure that the lure was always moving with the flow, and therefore, looking more natural. Over the course those sessions I managed to land a further dozen bass on the senko and the ‘new’ needlefish, with a bite a cast experienced at times. Indeed, my fishing companion during a couple of these sessions decided to rig an additional hook onto the tail of his senko – resulting in him outfishing me on those occasions (there could a further blog post to expand on this method). Another bass for the my ‘new needlefish’ lure. During any choppier or swell sea conditions, or when/where the current was fiercer, this lure came to the fore. So despite catching a lot of bass througout the second half of March, from the mark mentioned above and two others that I would say are similar, at least in respect to the topography of the seabed (although with more conspicuous underwater features) I didn’t manage to land anything that I would describe as significant in size (4lb+ in my book). Buy why? Where were the bigger ones? As always, I have a couple of theories, not excuses I hasten to add (as I’m certainly not ashamed to have not caught a 4lb+ bass in March) about the reasons for this, despite connecting with this calibre of bass in previous weeks of 2019. This 2lb bass nailed the senko, yet many of its compatriots simple ‘nip’ the tail – proven when my companion out-fished me twice with an additional hook rigged onto the tail of the lure. Secondly, following the peak of the very high spring tides of (5.7m on my local scale), as the high tide height decreased to 4.6m, the barometric pressure rose from 1022Mb to a 1040Mb. Now, the average ‘air pressure’ reading in the UK is around 1013Mb and the sea level can fluctuate (locally) by 1cm per Mb (or Millibar), therefore, it is possible that the very high readings could have affected things. Let me explain… When you consider that the marks where I have been fishing are only covered by between 12″-3ft of water during the stages of the tide I am fishing them, then potentially, on these smaller tides and when the barometric pressure was unusually high, it could have deterred the bass (or just as likely, whatever they were feeding on) to venture into the shallows. It’s just a theory! Thirdly, and the reason that seems most plausible to me, is the fact that during three of our sessions a seal was feeding right in front of us! Now I completely respect everyone’s opinion, theories, observations and overall ideas about anything related to bass/lure fishing and I realise that some of you swear that a seal being in the vicinity is a good sign and that you’ve enjoyed a red-letter as a result of its presence. However, my personal experiences in relation to these somewhat ‘fisherman friendly’ creatures, is that if they pop their heads up within 50m of you it is simply ‘game over.’ The smaller bass are quite possibly ‘less aware’ of the danger of being eaten, but the older, wiser and therefore larger bass most certainly are ‘aware.’ Maybe, I have been unlucky not to hook into abig one then, or maybe I’ve just used up all of my luck! April signals the start of my ‘guiding season’ that will run all the way through to at least mid-December, and quite possible into the early stages of 2020 if the bass are still around (as they clearly have been this year). This will be my second season as a full-time professional bass guide and I am, of course, massively excited to get going! If you are interested in booking a session with me (they start at £80 for a 4 hour slot) or indeed, if you are considering one of my 3 Day Packages here that include B+B accomodation for £499 per person then please do get in touch via my Contact Me page or via the Contact Form at the bottom of this post. The recent reviews in the angling press (by Henry Gilbey and the Bass Anglers’ Sportfishing Society) can be found here. Furthermore, this self-published book is currently only available directly from me. Therefore, if you would like to purchase a copy you can either pay via PayPal (via the icon below) or if you do not have a PayPal account or you require postage to a location outside of the UK then please contact me via the Contact Form at the bottom of this post. A modern approach to catching European Sea Bass on lures by Marc Cowling.